SpaceX plans to try again Thursday, April 11, to launch the world’s most powerful rocket from Kennedy Space Center. 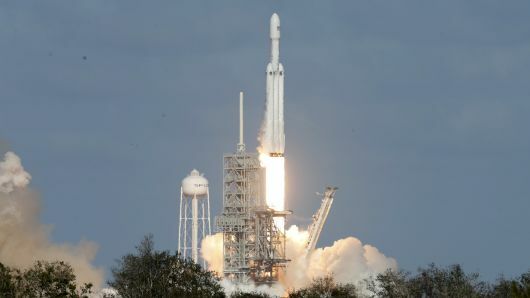 Big crowds hoping to see the Falcon Heavy blast off Wednesday were disappointed when strong high-altitude winds that could have blown the rocket off course halted the mission’s first countdown. • Traffic: Big crowds and heavy traffic are expected for the second flight by SpaceX’s heavy-lift rocket. “Please expect delays and plan accordingly,” NASA said in an advisory about road restrictions and closures. Landing: Less than eight minutes after liftoff, the two side boosters will fly back to Cape Canaveral Air Force Station to attempt side-by-side landings on legs, unleashing thunderous sonic booms. That’s a trick tried only once before, successfully, during the Falcon Heavy’s debut launch on Feb. 6, 2018. The demonstration mission made headlines around the globe for sending SpaceX CEO Elon Musk’s Tesla Roadster and its “Starman” chauffeur on an orbit reaching as far as Mars. The rocket’s center booster will attempt to touch down on a ship stationed hundreds of miles down range in the Atlantic Ocean, something that was not pulled off last year. About the mission: Thursday’s payload isn’t quite as creative as a sports car, but is more important because it belongs to a paying customer: Saudi Arabia-based Arabsat. The hefty Arabsat 6A communications satellite, built by Lockheed Martin, weighs in at more than 14,200 pounds and is bound for an orbit high over the equator, a mission that required a more powerful rocket than SpaceX’s standard Falcon 9. About Falcon Heavy: SpaceX advertises Falcon Heavy launches for $90 million. That’s reportedly less than a ride on Europe’s Ariane 5 rocket, which launched a sister satellite to Arabsat 6A in February, and a fraction as much as United Launch Alliance’s Delta IV Heavy. A third Falcon Heavy mission is planned as soon as June for the Air Force.